See our kinesiology tape instructions below to learn more on how to better apply and use CureTape® kinesiotape. THYSOL has created this page in response to the many questions it has received world-wide regarding tape application and use. These kinesiology tape instructions apply regardless of the tape technique e.g., Lymph taping, physiotherapy taping. Always make sure to be stuck to the skin is clean, dry and free of grease. It is always advisable to stick the kinesiology tape on the “bare skin”. A hairy skin sticky tape less and late (so) quicker release. Since the kinesiotape must be removed, it is recommended to remove the hair. Razor blades are thereby not recommended since there earlier wounds can be caused by shaving. The achievement of the paper tape is easiest if one cut piece of tape with the cotton side keeps to itself and the finger is on the upper side. It is also possible to tear the paper first (in a number of techniques, it is recommended that even this emphatically. The base and the armature of the kinesiology tape are always applied without stretching. Base and anchors the kinesiotape will always be clipped around the tape thus remains better and longer. Avoid folds in the kinesiology tape or in the skin under the tape, in areas with folds easily cause blisters. If the kinesiotape was built, light and prolonged rubbing warm for optimal adhesion. The kinesiology tape adheres better if the material is warmer, therefore be careful application of heat to areas of skin with tape (for example, do not blow dry). Sometimes there is short-term (10 to 20 minutes) itching under the tape. This is no problem. Itching or irritation that lasts longer than half an hour, the kinesiology tape must be removed. The kinesiology tape must be removed carefully. Easy is it for example to do under the shower by the application making quite wet, tightening the skin and tape from top to bottom of the skin roll down and compromising the skin with the fingers on rack. The best way to remove the tape is painlessly through the use of an oil (baby oil). Oil acrylic adhesive dissolves. It is also possible to sprinkle the tape-application with Sterilium whereby the adhesive layer also dissolves. There can cause skin irritation and blisters occur when the kinesiotape is removed careless mistake, but also by application of the tape. Too much strain can cause irritation and blisters. To get as many “convolutions” (visible ripples on the kinesiology tape by the lifting effect of the skin), you can bring out the best skin to stretch and apply the tape with minimal strain. The kinesiology tape can be used only in the length. If smaller tapes are required, (e.g. for children), the width of the tape need to be trimmed. By treating the skin before taping with 3M Cavilon Barrier Film spray can prevent possible skin irritation. the adhesive strength of the tape also increases so that the kinesiotape can be worn for longer. It is always advisable to tape to the skin to be treated with this spray. THYSOL is exclusive to its own brand kinesiotape: CureTape®. 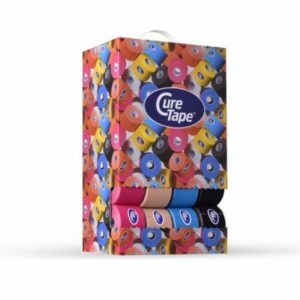 Since 1998 CureTape® is produced in our own factory in South Korea, because we manage the production process itself, we can guarantee the highest quality.